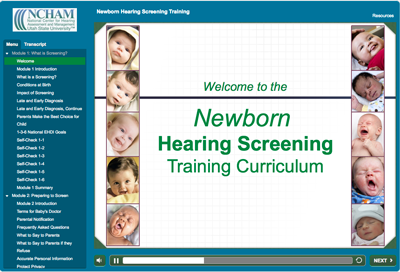 The NHSTC is an interactive competency-based course designed to provide the learner with a thorough understanding of the components necessary for conducting quality newborn hearing screening. The recommended practices throughout the course are based on the Joint Committee on Infant Hearing (JCIH) Position Statement. By taking the course, screeners and stakeholders will have the necessary foundation to do a thorough job and feel confident in their role. In its entirety, the course generally takes approximately two hours to complete. As the NHSTC is a user- friendly, web-based course participants can learn at their own pace. Those who complete all required elements of the course are eligible for a Certificate of Completion provided by the National Center for Hearing Assessment and Management (NCHAM) and if eligible, continuing education credits provided by The American Academy of Audiology (AAA) and the National Association of Pediatric Nurse Practitioners (NAPNAP). Currently, there is no charge for the course. Although the course includes video demonstrations of babies being screened, it is not intended to replace “hands-on” equipment specific training with newborns. For optimal training outcomes, we recommend all screeners complete the NHSTC as well as demonstrate “hands-on” competencies screening babies with the specific screening equipment used in their facility. In the Resources Section of the NHSTC there is a “Skills Checklist” pdf that can be used for documentation of “hands on” competencies. This course requires Internet Explorer version 9 or higher, Chrome, Firefox, or Safari. Users must have cookies enabled and popups allowed. Create a user account for the Moodle Learning Management System. There are 3 main parts to the course. Part 1: the Pre-test, Part 2: the curriculum, Part 3: the Post-test. All 3 parts MUST be completed in their entirety with a passing score of 80% or higher on the Post-test to be eligible for a Certificate of Completion and continuing education credits. Further information on CE/CEUs is below. Certificates are created and emailed by NCHAM staff. Please allow several business days to receive your certificate. If you have questions or do not receive your certificate, please contact the NCHAM Help Desk. If you are not interested in earning a Certificate of Completion and/or CEUs/ CE Contact Hours, you can watch the course instantly online. The NHSTC can be retaken for recertification by logging into Moodle with the same account that you used in the past. It is recommended that recertification is completed annually or one year after you completed the core curriculum and received a certificate of completion. It should be repeated every year after that. American Academy of Audiology (AAA) CEUs are available for this course, 2 hours (.2 CEUs). This course is Beginner level. In order to receive CEUs the entire course must be completed and the exam passed with a score of 80% or better. Participant CEU information will be submitted to AAA in 2018 four times: March 31st, June 30th, October 31st, and December 31st, 2018. To register for AAA CEUs please provide your AAA ID number, first and last name, and email address. There is no charge for this course. Utah State University is approved by the American Academy of Audiology to offer Academy CEUs for this activity. The program is worth a maximum of .2 CEUs. Academy approval of this continuing education activity does not imply endorsement of course content, specific products, or clinical procedures. Any views that are presented are those of the presenter/CE Provider and not necessarily of the American Academy of Audiology. If you have questions about AAA CEUs, please contact Randi Winston. National Association of Pediatric Nurse Practitioners (NAPNAP) CE Contact Hours are available for this course, 2 hours. This course is Beginner level. In order to receive CE Contact Hours the entire course must be completed and the exam passed with a score of 80% or better. There is no charge for this course.